ASQA’s increased regulatory action poses a massive threat to those RTO’s who do not have an adequate focus on delivering quality training and assessment. Now, more than ever, RTOs must have quality assurance systems in place to ensure they remain compliant with the Standards. 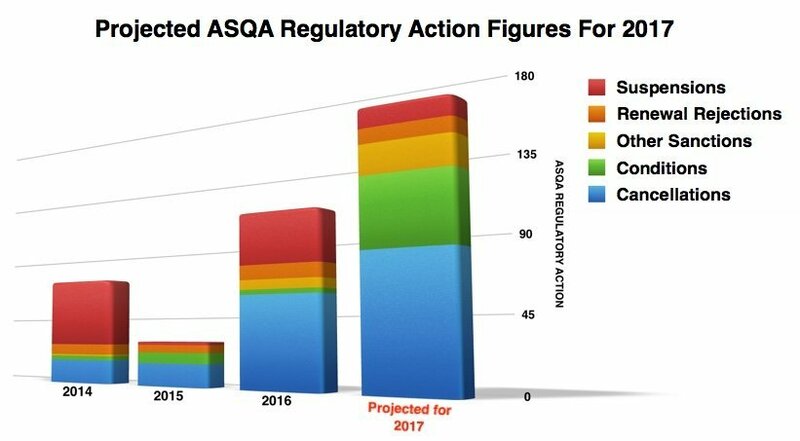 Compliant Learning Resources completed an analysis of the ASQA regulatory actions over the last four years, and the statistics are alarming. The number of regulatory actions reached 54 at the end of April 2017, meaning we are headed for a record year of RTOs impacted by ASQA regulatory measures. We see these actions as a positive move to improve the quality of training and assessment in Australia. Training providers should support this increased regulatory focus, by delivering quality training outcomes for their learners. Regulatory actions include sanctions, operating conditions, suspensions and are as severe as registration renewal rejections and registration cancellations. With cancellations forecast to increase by up to 30% in 2017, RTOs must take a hard look at their training and assessment resources, systems and processes to ensure they are not going to be impacted by these regulatory decisions in 2017. 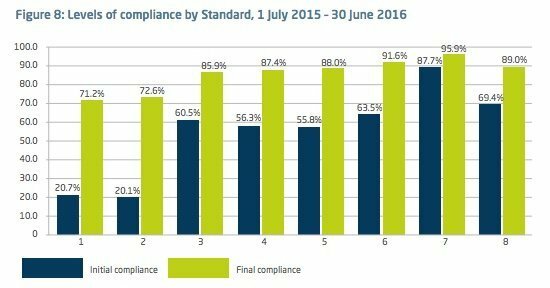 In their 2015-16 Annual Report, ASQA identified the highest percentage of non-compliances in Standards One and Two. These Standards directly relate to the quality of the Training and Assessment that RTOs deliver. The report highlights a very real problem, with only 20.7% of RTO’s compliant with Standard One at initial audit and only 20.1 % compliant with Standard Two. arning Resources are acutely aware of the issues and risks associated with incorrect assessment methods and inadequate assessment tools. Far too often we see RTO’s purchase “off the shelf” resources without doing their due diligence and validating them against unit requirements. Too much trust is given to the resource publisher’s claims of compliance, especially given the risks RTOs face in getting it wrong. The cost of purchasing the cheapest resource is far greater than the price of the resource itself, it could cost the registration of the RTO itself. Of course, there is also the cost of redeveloping the resource to meet the requirements, post validation. These risks and expenses are often not considered or underestimated in the purchase of new resources. With the emphasis often put on acquiring the “cheapest” resources to deliver a new or existing course. In this increasingly quality focused regulatory environment, RTOs need to understand that every decision they make in relation to their training and assessment operations has a risk associated with it. Quality assurance processes and procedures must be implemented to ensure that all training and assessment conducted meets the expected Industry and Competency Standard outcomes. Understanding the real cost of non-compliance makes it easy to make the right choices, so we can focus on delivering quality training and assessment to meet the future needs of Australia. In the table below, we have broken down the regulatory action taken each year and included our predictions for 2017. These figures are published on ASQAs website in the ASQA Decisions table. The most alarming statistic is the increase in cancellations. We calculated our projections based on the number of decisions to the end of April 2017 and extrapolated those over the full duration of 2017. If our predictions are correct, we are likely to see more RTO registrations cancelled in 2017 than ever before. It would be great if we can start to see these figures trend the opposite way in years to come. For this to happen, RTOs need to take their commitment to delivering quality training and assessment seriously, and focus on meeting the needs of industry and their students. This indicates ASQA is really raising the bar for compliance, including introducing a new, stricter audit model in 2018. They have also imposed a new initial RTO registration process in 2018 with much more stringent requirements, meaning it has become significantly harder to register a training organisation in the first place. You can see the latest decisions imposed by ASQA here. As of 20/2/2019 there are currently 4213 RTOs (excluding those that have been cancelled, suspended, have re-registration pending or are in administration) and it will be interesting to monitor that total in the coming years. The current RTO list can be seen here. Demand for vocational training continues to be strong, but the number of training organisations able to service that demand will potentially dramatically decrease over the coming years as a result of tighter compliance standards and less new registrations, potentially massively increasing the value of your RTO – if you can keep it! More than ever before, it’s important to stay on top of your RTO’s compliance obligations and be continuously updating and improving your systems and processes. Our learning and assessment tools often provide students with simulated business websites that allow them to access workplace policies and procedures, as well as workplace templates and other workplace documents. We also partner with a large number of training resource publishers offering thousands of units of competency between them to help you find the right training resources for your RTO. If you are concerned about the compliance of your current learning and assessment resources or are looking for compliant resources to submit with an addition to scope application, you can find all of our fantastic learning resources by accessing our Learning Resource List on this website. If you want new learning and assessment resources, get in touch with one of our Learning Resource Coordinators today. 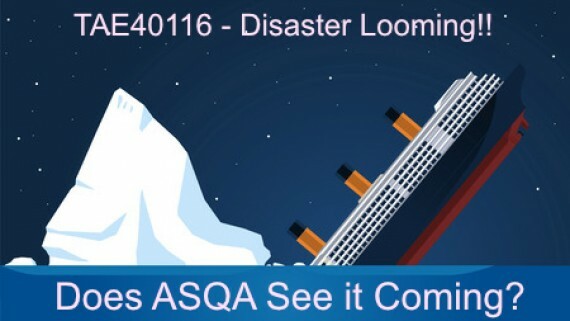 TAE40116 Transition – ASQA’s disaster waiting to happen?